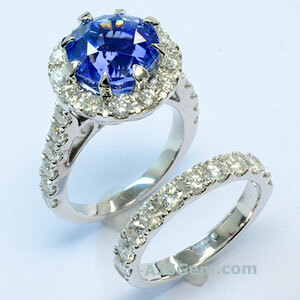 Sapphire has become increasingly popular for engagement rings. While sapphire is generally less expensive than diamond, it is not the cost alone that entices buyers to sapphire. For many buyers, it is rather the opportunity to buy a unique gem with vivid color, and in a larger size. Celebrities have also helped to make sapphire and ruby engagement rings a fashion trend, starting with the blue sapphire ring that Prince Charles gave to Lady Diana Spencer in 1981. The same ring ws used by Prince William for his engagement to Kate Middleston in 2011. Prince Andrew, the younger brother of Prince Charles, also gave his fiancee Sarah Ferguson an engagement ring with a colored gemstone in 1986 -- a pigeon's blood ruby. Many well-known actresses have shown off sapphire engagement rings, including Jennifer Lopez, Penelope Cruz and Catherine Zeta-Jones. Sapphire is an excellent gem for a ring that will be worn every day because of its superior hardness (9 on the Mohs scale), lack of cleavage and high refractive index. Of all the colored gemstones, sapphire is the most durable. But while sapphire's durability will appeal to your practical side, it is the choice of exciting colors that draw buyers away from the sameness of white diamonds. Blue is the classic color for sapphire, and blue sapphire makes a gorgeous ring when set with diamond accents in white gold or platinum. A richly saturated royal blue is considered the top color, but blue sapphire shades ranges from baby blue to navy. Though blue is undoubtedly the most popular color for sapphire engagement rings, there are other appealing choices as well. 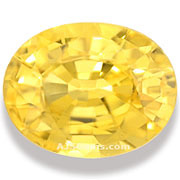 Yellow sapphire can have the same look as canary diamond, with a delicate hue and great sparkle. Yellow sapphires over 5 carats are not uncommon and are still affordable, while blue sapphires over 5 carats are now very expensive. 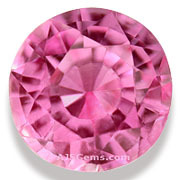 Pink sapphire is another popular choice. Hues range from pastel to vivid pinkish-purple. Like ruby, pink sapphire is colored by chromium, and the higher the chromium content, the deeper the pink color. 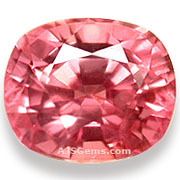 The rarest sapphire color is the pink-orange Padparadscha, reminiscient of the color of the lotus flower. These rare sapphires were originally found in Ceylon, and more recently in Madagascar and Tanzania. One thing to remember with sapphire is that it is a denser material than diamond, and is usually given a deeper cut to maximize color. Thus a 1 carat sapphire will generally appear smaller than a 1 carat diamond. When buying sapphire always check the dimensions of the gem, not just the carat weight. The traditional sources for fine sapphire are Ceylon (Sri Lanka), Burma and Kashmir. Though no significant deposits of sapphire have been found in Kashmir for more than 100 years, Ceylon continues to be a prolific producer. More recently Madagascar has become an important source for fine sapphire, and Tanzania is also producing some good material.